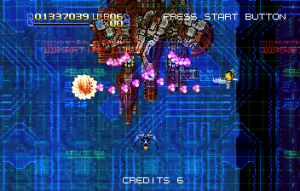 Treasure, developer of such standout hits as Gunstar Heroes, gained quite a bit of popularity with fans due to their adherence to old school conventions, combined with innovative mechanics, explosive action, and an amusing sense of humor. Yet they mostly produced side scrolling action platformers or beat-em-ups – it wasn’t until six years after their foundation that they created their first real shoot-em-up – Radiant Silvergun. 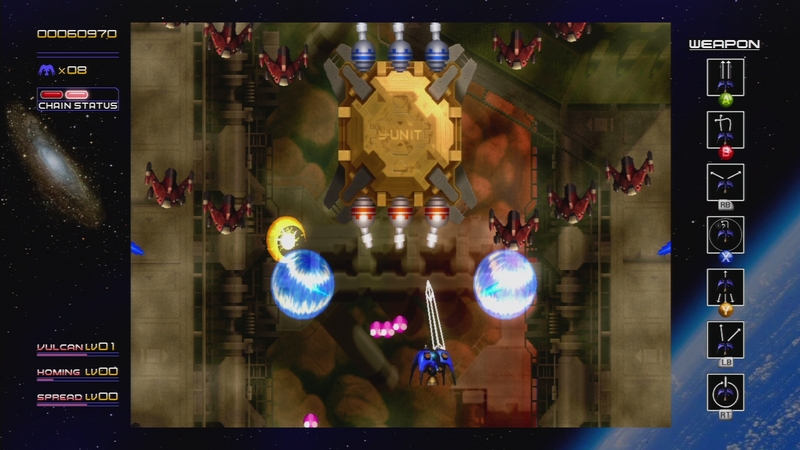 It may have been beginners luck, or it may just have been the collective culmination of years of brilliant video game development experience, but Radiant Silvergun outclassed most of its previous titles, and even eclipsed most shooters from other companies. It’s one of the few shooters that can actually be qualified as “epic” – its ambitious storyline, its wondrous presentation, its tightly paced level and boss design. Radiant Silvergun is an overhead shooter where you have three primary weapons, assigned to three primary buttons. 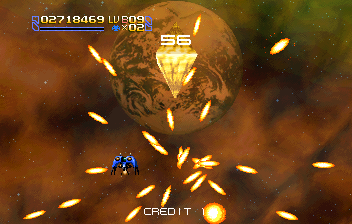 The A button fires standard, forward firing projectiles, the kind that you’ll probably be using most of the game. 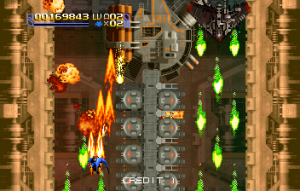 The B button fires homing projectiles which are versatile, but weak. 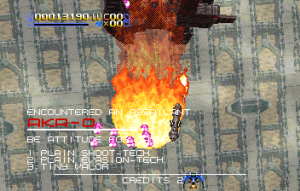 The C button fires out two lasers at a wide angle, which explode on contact – the most powerful of the weapons, but the most awkward to use efficiently. Pressing each of the buttons together will attack with a different weapon. 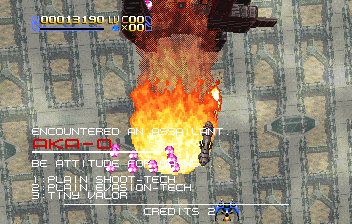 A and C together will activate a close range targeting system, which will launch missiles at anything that comes near, and is useful for firing at enemies behind barriers or finding hidden objects. A and B together will activate another targeting system, which fires two lines from the front of your ship – if they hit an enemy, it will lock onto them and electrocute them, until they either explode or they fall out of your range. The A and C weapon is much simpler – it simply acts as a variation of the standard A weapon, except it shoots from the ship’s rear, allowing you to attack enemies from behind. Not all of the weapons are perfectly balanced – you’ll find yourself using certain ones more often than others – but there’s rarely a wrong way to approach a situation, which offers a refreshing amount of freedom. The most interesting weapon – though perhaps not always the most useful – is your Radiant Sword, activated by pressing all three buttons simultaneously. It’ll swipe around your ship in a circle, but if you hold down the buttons, it will stay brandished, and can be swiped around by moving. 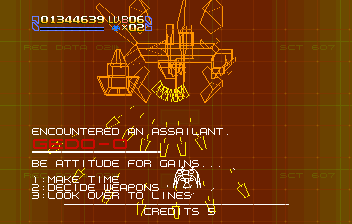 It isn’t easy to wield, but it is efficient, especially if you feel daring enough to sit right in front of an boss’ face, which does continuous damage as long as it’s drawn. The sword has a secondary function, however – certain enemies will spit out slow moving purple bullets, which can be absorbed by the sword attack. Once you absorb enough, you’ll become super charged, and can execute a special attack, calling upon two gigantic blades to crush everything in front of you…and rendering you temporarily invulnerable in the process. This is actually extremely important to note – many overhead shoot-em-ups grant you a number of screen clearing bombs at the beginning of each new life. It’s essentially a free pass – it’s whispering that, hey, we know that we can toss everything and the kitchen sink at you, and sometimes it can feel impossibly overwhelming, so here’s a “get out of jail free” card to use at your leisure. 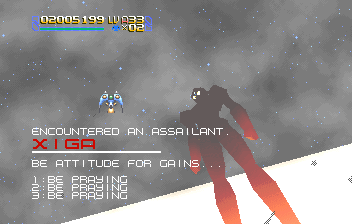 In some ways, Radiant Silvergun is not so charitable – you need to earn your super attacks, and even then, only when the game allows you. 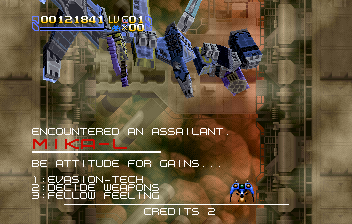 The key to this is that Radiant Silvergun never really puts you into overwhelming situations to begin with. It’s a difficult game – a requirement for any great shoot-em-up – and it has no problem in flooding the screen with enemies, bullets, lasers, flames and whatnot. But it’s also a meticulously paced game that, despite its difficulty, is almost always fair. 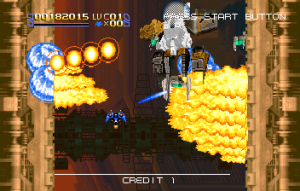 Some shoot-em-ups scroll so quickly that you’re dead and resurrected before you even know what killed you. 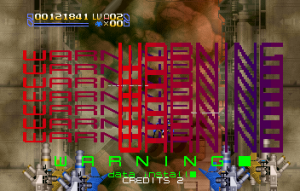 In Radiant Silvergun, you’ll always see what killed you, and you’ll always know what you did wrong. In some ways, it’s reminiscent of methodical shooters like R-Type, though Silvergun‘s instant resurrection makes the proceedings feel less like trial and error. Radiant Silvergun‘s relaxed pace is arguably one of its biggest shortcomings. A whole playthrough takes roughly an hour, and it’s in no rush to get to its conclusion. The screen scrolls slowly, enemies casually saunter on to screen, fire their bullets, and stroll away just as effortlessly. Even your ship is a bit on the sluggish side. 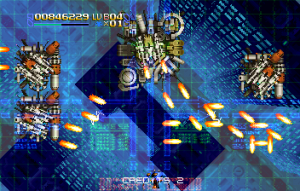 Although it lacks the frantic pace of more chaotic shooters, it will still force you to weave through corridors of deadly enemy fire – it replaces twitch skill with pure, unnerved intensity, which is almost more exciting. 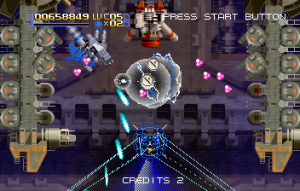 To complement its design, Radiant Silvergun has an intriguing scoring system dictates what you should and shouldn’t shoot. 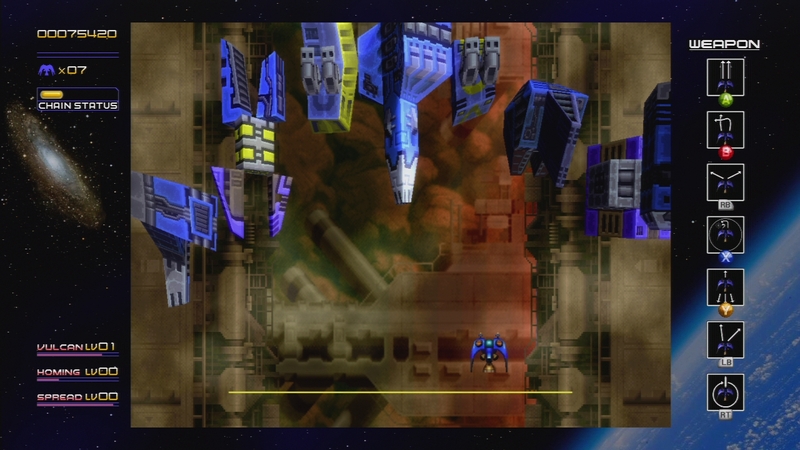 All enemies can be classified as one of three colors – red, blue, or yellow. If you manage to kill three enemies in a row of the same color, you’ll get a scoring bonus. Kill another set of the same color, and the score bonus increases. Soon it goes up and up and up, until you get incredible bonuses. 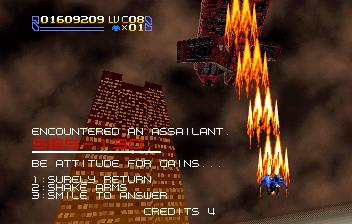 It’s a strange thing, playing a shoot-em-up where effectively avoiding two-thirds of the enemy populace is the best way to win big. 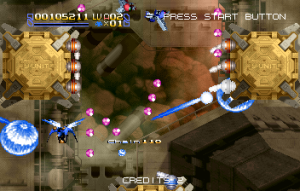 But Silvergun is different from a lot of shooters in that the scoring system actually has a huge impact on the game itself, not just something fancy to brag about amongst other shooter fans. 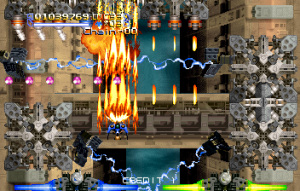 There are no standard power-ups to be found – instead, each of your three weapons is upgraded by your score, depending on which weapons you use to wrack up the combos. Your weapon’s power level stays upgraded throughout the entire game, even when you die, even when you continue. There are other ways to boost your score too. 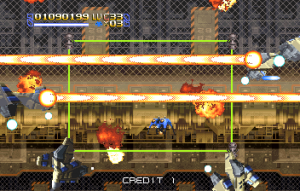 All of the bosses consist of multiple segments that can be damaged and destroyed independently. You can take down its weak spot for a quick kill, but you get a huge destruction bonus if you dismantle it completely before destroying it. 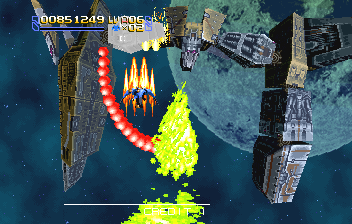 If you play the scoring game poorly, you’ll end up fighting the final areas with an underpowered arsenal. Play it well, and you can tear through foes like the proverbial warm knife through butter. As such, there’s no throwaway situation – every enemy you kill is an investment in your future. The color palette is a bit on the drab side, consisting of drab sepias and browns, and largely repetitive scenery. 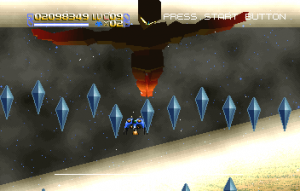 Through most of the game, you’re flying straight over 2D scenery, but occasionally your boosters kick in and you soar into the sky, as the horizon tilts and the ground races beneath you, utilizing 3D polygon effects. It’s a huge contrast when the game injects some amphetamines and kicks itself into high gear, as your ship begins scaling an infinitely tall building or dives into underground sewers. Every since the Genesis days, Treasure has been the master of taking a 2D world and making it feel three dimensional, and they do it just as fantastically with Radiant Silvergun. 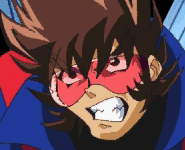 All of this is punctuated by Hitoshi Sakimoto’s fantastically dramatic soundtrack. Sakimoto is usually known for RPGs and strategy games, although he composed for shooters like Mahou Daisakusen and Soukyugurentai earlier in his career. 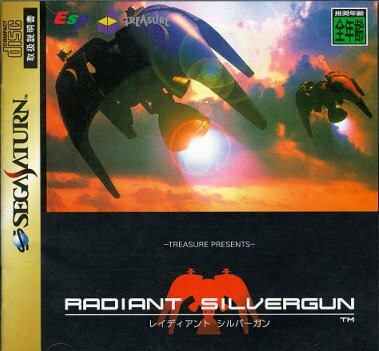 Radiant Silvergun‘s soundtrack is substantially similar to his work on Final Fantasy Tactics – also known as one of the best video game scores in existence – featuring strong synth orchestrations, heavy on trumpets, violins, pounding drums, and even ringing bells. It’s such a huge change from the typical shoot-em-up score that it lends a very original feel to a game that’s already pretty unique, even though it is pretty typical of Sakimoto’s other works. If there’s any downfall, it’s that it tends to get a bit too repetitive. The game is pretty long, and there are only a handful of themes. And per Sakimoto’s usual style, there’s a strong motif that’s repeated through many of the tracks, which does make it feel a bit samey. Beyond just the graphic design and music, Silvergun oozes its own style. 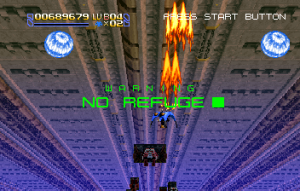 Each boss battle begins with an extremely cool looking “WARNING” animation, complete with ominous sirens and the now-famous line “NO REFUGE”, before rattling off its name and a number of “Be Atitudes”, some nonsense Engrish phrases that attempt to give you advice on how to handle your assailant. Although the battles themselves are nearly all brilliantly designed, most of the bosses lack the type of personality found in other Treasure. 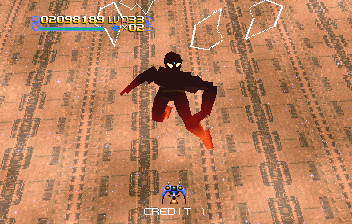 Unlike most of the enemies, which are sprites, the bosses are nearly all polygon models, and do tend to look a bit generic. There is one particularly cool boss fight where, for reasons that aren’t entirely explained, the entire screen turns into wireframes, complete with blippy sound effects mimicking old computer games. 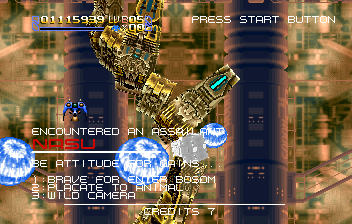 Still, everything culminates in what is possibly the most incredible boss in a shoot-em-up – an assault against a being called Xiga. It’s a gigantic humanoid with superathletic strength and dexterity, being able to run across the neverending landscape, leap, and pound on your ship, all while the world is swirling around chaotically. The fight takes on several forms, the last of which reveals the shining crystal that appears after each boss battle. In the final moments, you cannot shoot any bullets – you just need to stay alive for sixty seconds, dodging a torrent of curtain fire that floods the screen, before you can witness the ending. 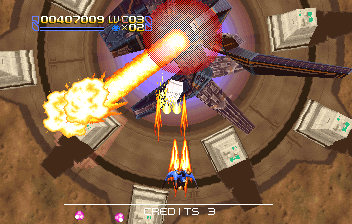 Radiant Silvergun saw release both in the arcades and on the Sega Saturn. 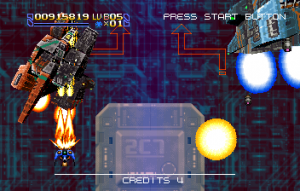 The arcade game is pretty straightforward, without any story segments – as such, the flow of events seems a bit odd and nonsensical. 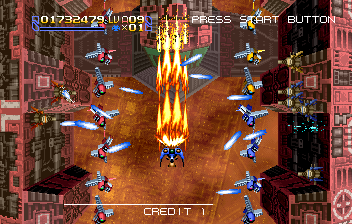 The game actually begins on Stage 3 – at the end of this stage, you can pick to tackle either Stage 2 or Stage 4. 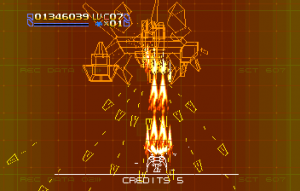 The game continues all the way up until Stage 6, before being cryptically flung to Stage 1 to fight the final battle. 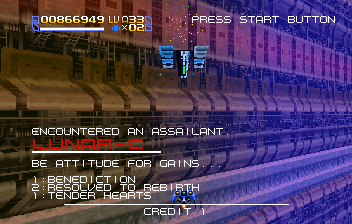 With the Saturn Mode, we learn that the stages are actually number chronologically. Stage 3 is the beginning of the story, but Stage 2 is a flashback detailing earlier events, while Stages 4, 5, and 6 continue in order. At the end of Stage 6, you’re flung back in time to the beginning of creation – hence, Stage 1 in the game’s timeline. This all makes much more sense in the Saturn version, which includes a fully fleshed out story mode. 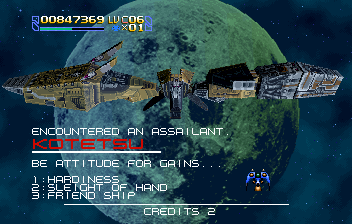 While a number of shooters, like R-Type and Gradius, have fairly detailed backstories, they rarely manifest themselves in the actual game. 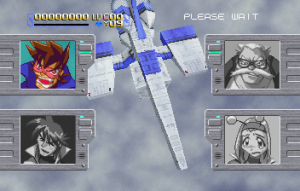 Radiant Silvergun actually has a pretty intricate plot, one that’s surprisingly dark for having such a bright, purposefully stereotypical cast of characters. The main character and pilot of the red Silvergun ship (player one), Buster is cool headed and heroic. The pilot of the blue Silvergun ship (player two), Reana is a bit light hearted and ditzy. She wears of pair of antenna for some reason, making her look a bit like a bee. The hot-headed son of Commander Igarashi, Gai is a largely incompetant fighter, and pilots the yellow Silvergun ship, which cannot be controlled by the player. 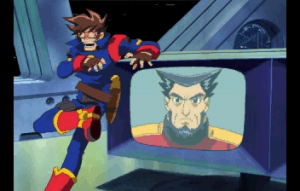 You spend a good chunk of the game getting him out of trouble after he blasts off without you. 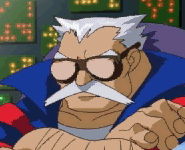 This old guy is the captain of the Tetra, and provides commentary from the seat of his ship. 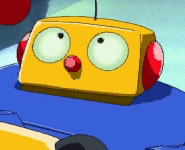 Creator Type ID00104, he’s a robot found by the crew, and seems to be connected to this mess somehow. 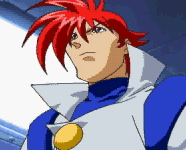 The leader of Earth’s military forces, your crew communicates him to learn of the destruction being caused on the planet. The opening anime begins with a conversation between the army and the starship Tetra, which is hovering outside of Earth’s orbit. During an archaeological dig, the scientists of planet Earth have unearthed a giant crystal. Buried with it is a Creator robot bearing the same serial number as the Silvergun’s resident mechanoid. They shrug this off as being impossible. 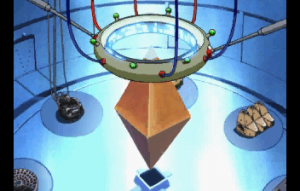 A short time later, the crystal goes haywire and begins summoning hordes of enemies to attack the earth. The Silvergun fleet, the only human vessel not caught under attack, reenters the atmosphere and attempts to save the dying remnants of the planet from extinction. The rest of the story is told through character portraits and voiceovers, along with another animation piece at the end. 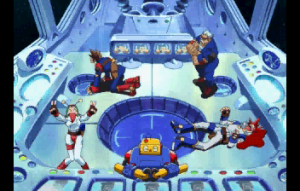 Although the first part of the opening is fairly comical, especially with the goofy character designs courtesy of Treasure mainstay character designer Han, it quickly takes a turn for the serious, with the all of the apocalyptic threats and such. 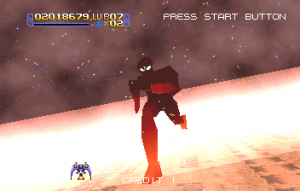 It’s pretty clear that the developers were influenced by the seminal anime Neon Genesis Evangelion when developing the plot, both from the second segment of the intro – wherein a panicked control room attempts to respond to an overwhelming menace – and the ending is similarly downtrodden. 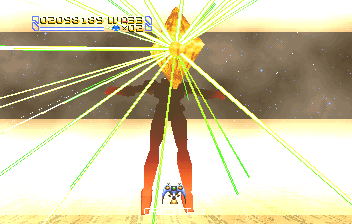 The crystal seen harassing you throughout the game is, more or less, God, and He’s pissed. 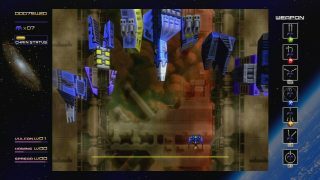 At the end of the game, you’re warped back in time, before the dawn of humanity, and your ships crash onto the barren earth. 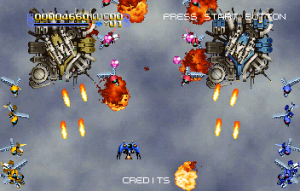 The two heroes, the pilots of the Silverguns, and the last remaining humans, have perished. And yet the Creator robot survives, and by using the DNA from his fallen compatriots, he clones them and begins humanity anew, bringing the entire storyline into a full, neverending loop. 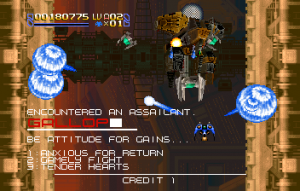 For a shoot-em-up to contain such heavy emotional impact is truly remarkable. In addition to all of the story segments, there are a few big changes to the regular Story mode. 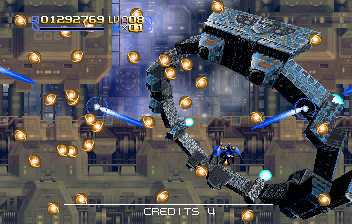 For starters, you need to play through both Stages 2 and 4 – you can’t just pick one like the arcade version. 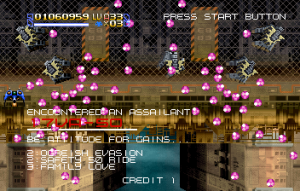 There are also five new boss battles. The arcade version had hidden “dogs” you could collect for bonus points, but the Saturn mode adds some extra ones, as well as a status screen where you can view your total collection. But perhaps most importantly, your weapon power is saved every time you play. That means if you get your weapons up to Level 8, then die and start over, you’ll begin the game anew with Level 8 weapons. You can continue to replay the game and upgrade your weapons to max through continual playthroughs. On one hand, this is almost a genius tactic – the level building makes whole thing package like an RPG encapsulated in a shooter, perhaps the only game that’s structured like this. With repeated plays, not only you gain the wisdom and experience that comes with memorizing the levels, but you also get a more powerful ship, which in turn builds up strength faster as you master the chaining mechanics. 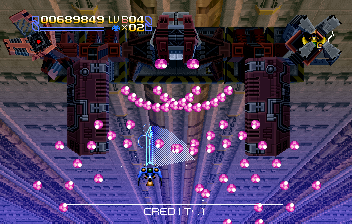 With each hour of play, you also get an extra credit – although you only start with three continues (and up to nine lives), you’ll eventually be able to see the end of the game, if you devote enough time to it. On the downside, the level building experience is really only effective during the initial playthrough. 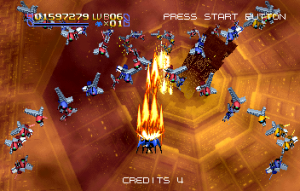 If you come back to it years later, only to find that your Saturn’s memory has been wiped, having to play and replay the stages to build up your weapons is a bit tedious. 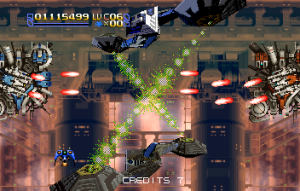 Radiant Silvergun saw a regular retail release in Japan, but its popularity saw the price skyrocket after the initial run disappeared from the marketplace, so for a long time, copies cost at least $150. That is, until 2011, when Treasure ported it to the Xbox 360 on the Xbox Live Marketplace. 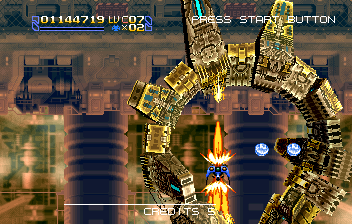 They most likely did this due to the success of their port of Ikaruga, which had been released three years before. 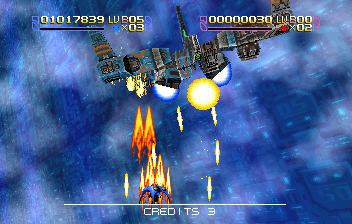 There are a handful of graphical upgrades, such as true transparencies rather than meshes, some lighting effects and some texture filtering, but it still very much looks like a Saturn game. You can disable each of these individually if you want a more authentic experience. 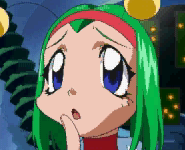 The intro video is now a much higher quality and all of the dialogue is left in Japanese with English subtitles. Naturally, this makes following the story during the level intro narrations somewhat difficult. The screen is still 4:3, with customizable borders breaking down the weapon combinations. Both the Original and Saturn (now called Story) modes are included, with the ability to save replays and upload leaderboard scores. In Original Mode, you can still set up to nine lives and you gain an extra credit for every hour you play, much like the Saturn release. 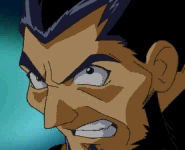 However, in the Story Mode here, you can’t continue at all, are granted three lives at the beginning, and only get one more life for every hour played. 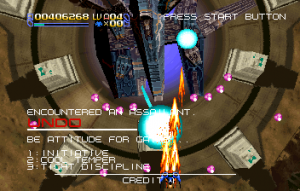 One of Radiant Silvergun‘s greatest boons is that the Story/Saturn Mode was more acclimated to home play, and eventually made itself approachable to lesser skilled players after enough time was put into it. That is no longer the case. There are ways around it – the timer counts even when it’s paused, so technically you can leave your 360 on for a whole day and find yourself with substantially more lives, but the change shouldn’t have been made in the first place. 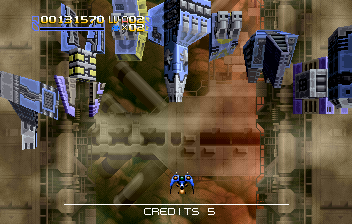 There is a new “Ikaruga” chaining method, unlocked if you have an achievement for the XBLA version of Ikaruga attached to your gamertag (which requires either buying the game or transporting your account to a system that does have it and playing it). 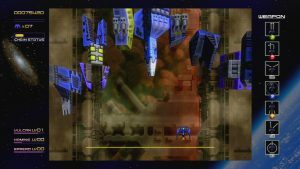 In this mode, you are allowed to switch colors between every three enemies instead of sticking with the same color throughout the entire combo. This is the best addition to this version, and it almost feels like certain areas of the game were designed for this system in the first place. The score values have been adjusted down a bit to compensate. 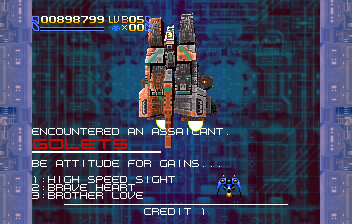 There are a few tossaway details that are missing, like the option to enable a visible hitbox and the screen that kept track of individual stats (and hidden dogs), but outside of the minor changes to the Story Mode, this is an excellent port, and it’s fantastic that such a long sought after game is now easily accessible.